TOWARDS the end of a dismal summer, when everybody who is anybody in the United Kingdom was departing for their annual holidays, dark clouds began to gather on the political horizon overshadowing that European storm-centre, the Balkan Peninsula. Angry clouds had gathered over the seething races of those lands so frequently that no one heeded when the cry “Wolf!” went up again. “Balkan troubles again,” said those who thought they knew, and they turned with renewed interest to places for the holidays. 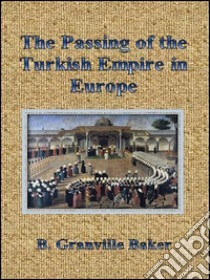 But the clouds gathered apace, and ere Europe was fully alive to the situation, protests, ultimata, and the usual amenities had been exchanged; the world found itself confronted by a war between the Ottoman Empire and its former subjects, now clearly defined nationalities, united to one purpose, and that the end of Turkish rule in Europe.